So yesterday I dragged my parents, Fatty and the kids to the bookstore. 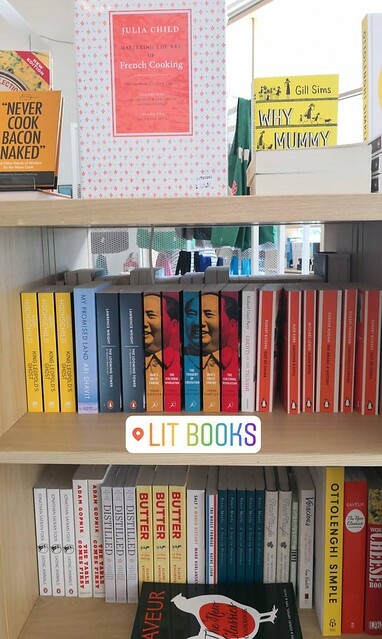 Not just any bookstore. I’d heard about this independent bookstore for a while now and wanted to go check it out! 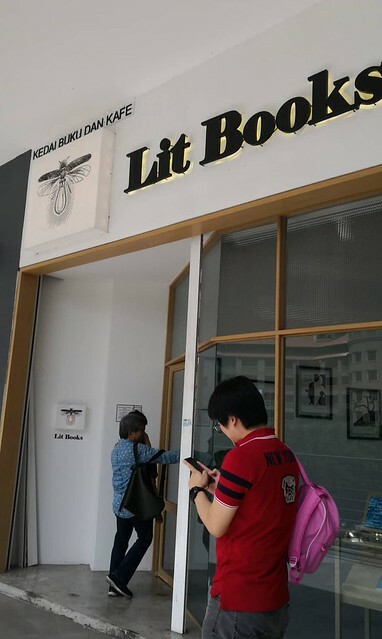 You don’t get many of these in Malaysia; our bookshops are all chain stores, and secondly, Malaysians don’t read all that much wtf. 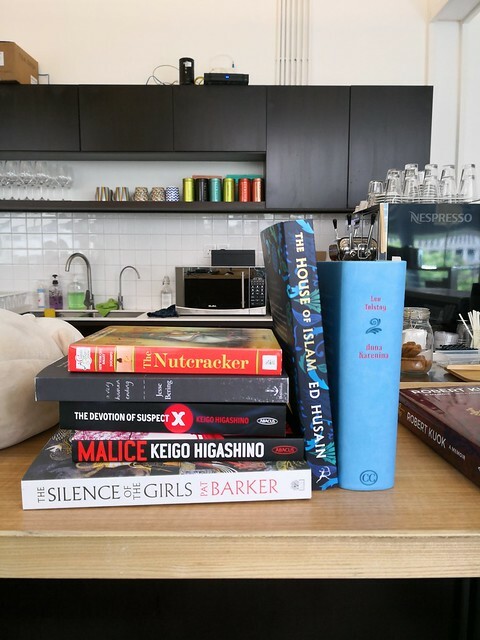 So while I love the big book chains, their selection can be quite typical (with the exception of Kinokuniya), and I wanted to explore what other books were out there. So this bookstore is owned by what looks like a huge bibliophile and his lovely wife! I heard that he curates books based on what he thinks are good and I always love me a good recommendation wtf. 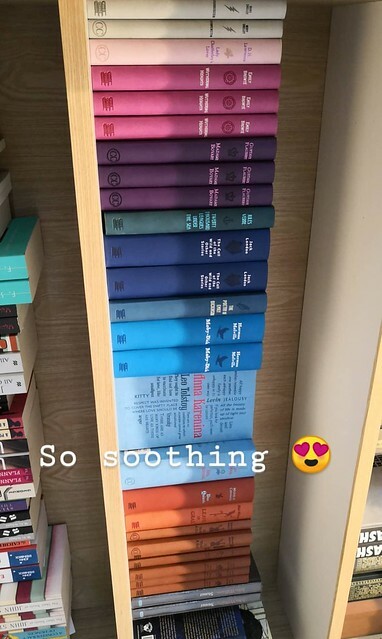 Also, I follow their Instagram and their books are gorgeous! Suet told me that he chooses the prettiest covers he can find for his books too so I was damn excited la ok.
Here’s the children’s corner of the store. 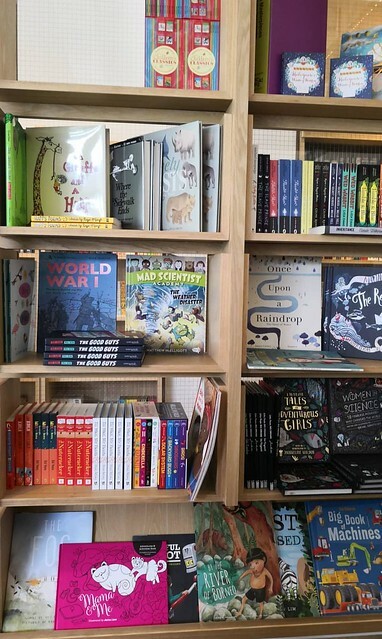 It’s not a big store and the kids section is just this one shelf but the books are beautifully curated. Fat Her Ooi and I went a bit mad in there hahahahah. There were so many pretty and interesting looking books! 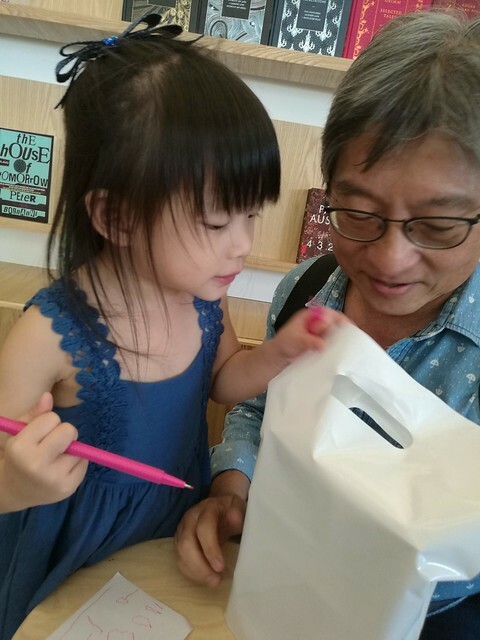 I paced myself through every section of the bookstore and must have scrutinized a hundred books, while Fat Her Ooi flitted about the shelves. Even Fatty who can be very selective about his choices, was engrossed; Fatty parked himself on a stool and started reading already wtf. 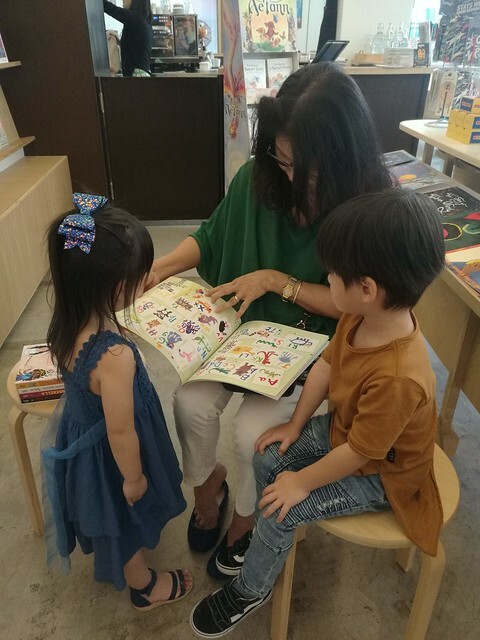 Meanwhile, Mummy Ooi entertained the two critters by reading them children’s books and at one point, they were drawing on scraps of paper the owner had given them. Fat Her joined them occasionally while I continued to browse. The store owner and wife would also chat with us and recommend reads. It was a very enjoyable afternoon! First, the owner saw a picture of a pink flower which she’d colored. “Oooh, very nice picture!” He smiled at her. Then out of the corner of his eye, he spotted another piece of paper that she was waving furiously. Fat Her Ooi’s signature – he drew this for me and Ooib even when we were kids wtf. He damn pro at it some more the way he draw, sure and bold lines that delivered the picture in the least strokes necessary. HAHAHAHAHAHA. HAHAHAHAHHAHA SERIOUSLY. I DON’T KNOW WHY OUT OF ALL PICTURES MY DAD DECIDED TO DRAW THIS ONE WTF. IS IT HE DON’T EVER WANT TO COME BACK TO THIS BOOKSTORE AGAIN HAHAHAHAHA. ONE DAY LATER EVEN WITH PENNY DOWN WITH HFMD, I’M STILL LAUGHING GUYS. HAHAHAHAHA. And that my friends, is yet another Funny Fat Her Story. You know the legend of the guy who practiced drawing fish for the emperor for umpteen years to reach the level where he may produce an expert fish drawing within 5 minutes to the emperor? 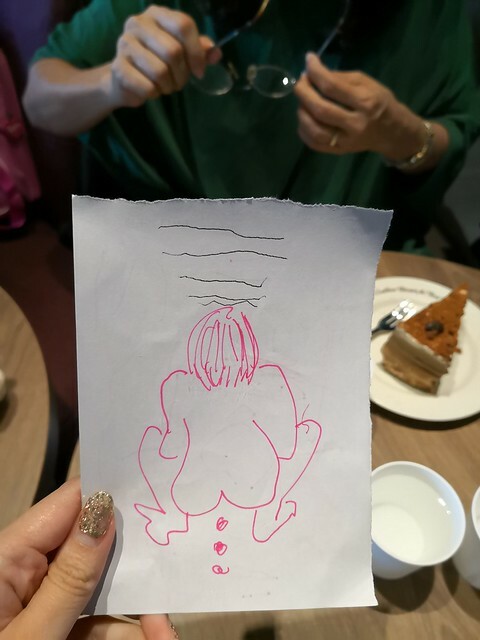 I feel like FatHer is that man, except that he has mastered the drawing of a shitting dude lol. PS: Can’t believe I finally managed to log in to leave a comment..gave up many times in the past because it was just too annoying. Didn’t want to use FB but disqus kept giving me problems logging in. hhahha.. no wonder you are funny.. because Fat Her also so funny to all of you from young age ..
HAHAHAHA yea he’s at kungfu master level now wtf. i didn’t know disqus had issues sorry! Yea it is really nice! i like to go to bookstore! its important to spend time with the children.